Is ranked joint 13397th with 71 other trigs (more). Towards the other end of a very hot 18 mile walk, going a bit slower now. Braved thousands of folk out in Corfe and Norden to see the Flying Scotsman. Amazing how popular steam trains are! Trig occupied by a very young lamb lying peacefully by it, left undisturbed. [FB for logging purposes only]. The challenges of Moonwalk training. Weather more typical of Nine Standards Rigg than Nine Barrow Down! Walked up bridleway through Kingswood on the way. 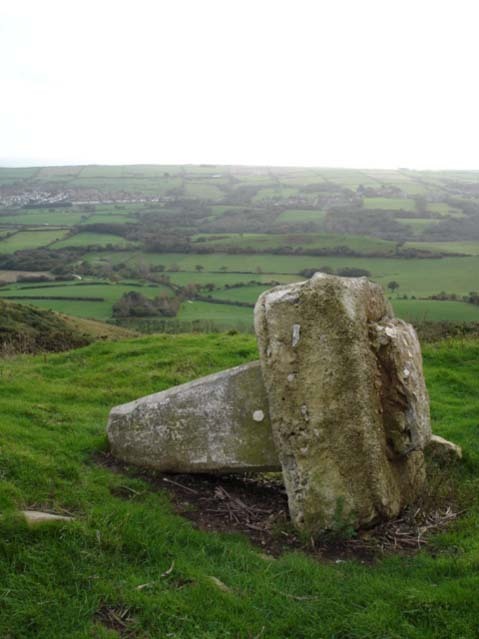 out onto nine Barrow down , and on along to trig , good views over Swanage. Annual visit, back up to 13 this year. Massively encouraged by wall to wall blue skies, but very hot and hazy. No change to trig. Steam train to Corfe (the 'Sir Keith Park' recently returned to Swanage so lots of attention from another equally anorakish group of folk taking photos!!). 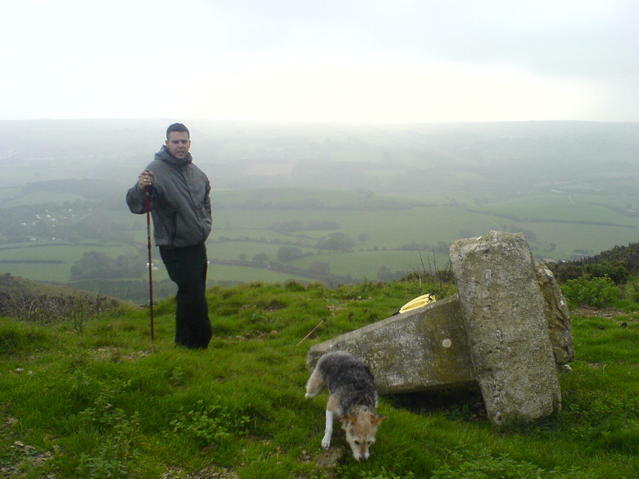 Vg cider at the Greyhound then cracking walk back along Nine Ballard Down with great views. 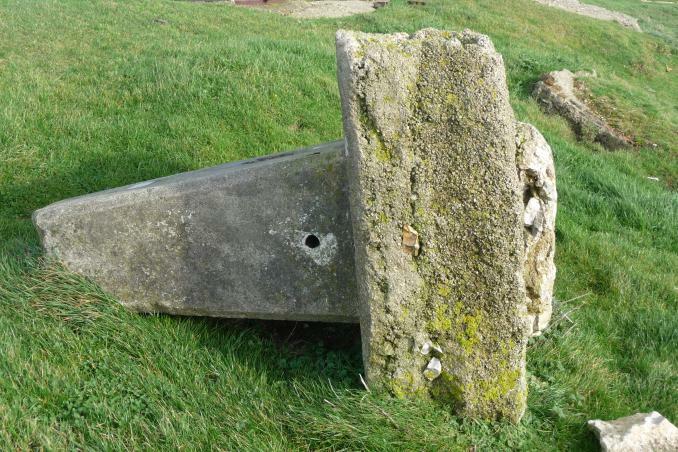 Can't work out whether this trig has moved again - farmer has been bulldozing the surrounding area. [FB for logging purposes only]. 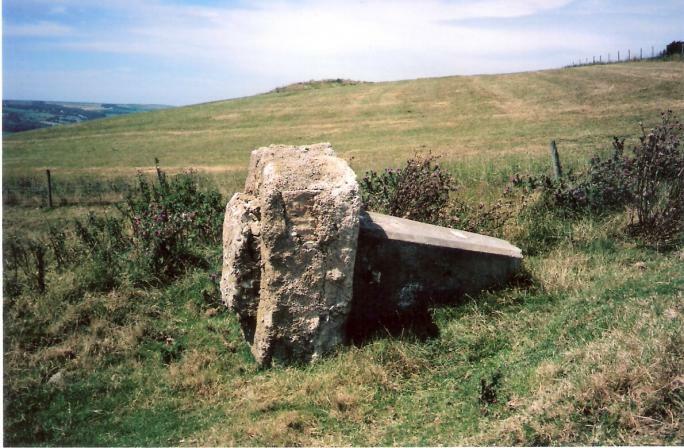 Still where it was moved to some years ago, condition unchanged. Usual walk from Studland to Corfe, but very cold, wet and windy; unusually for us, we abandoned the return leg and stayed in The Greyhound! 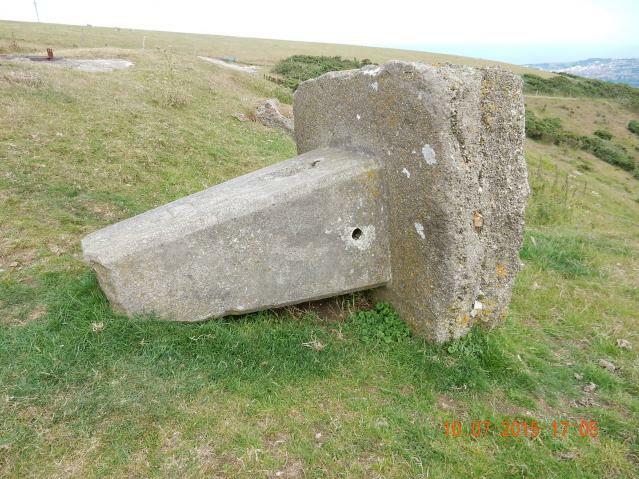 Trig point site? Ground by fence neae Marilyn summit and point marked for trig pillar on OS 1:50000. 9th Oct 2016 14:14 by Icarus. This one isn't marked on the 1:25 000 Explorer Map so I wasn't expecting to see it. It's on the 2014 1:50 000 though. It looks very dead but has a lovely view from its grave. Annual visit, this year down to only four of us diehards. But a wonderful sunny day for our walk from Studland to Corfe and back, with excellent visibility - could see all the way up the Solent to the Fawley chimney. Condition of trig unchanged. 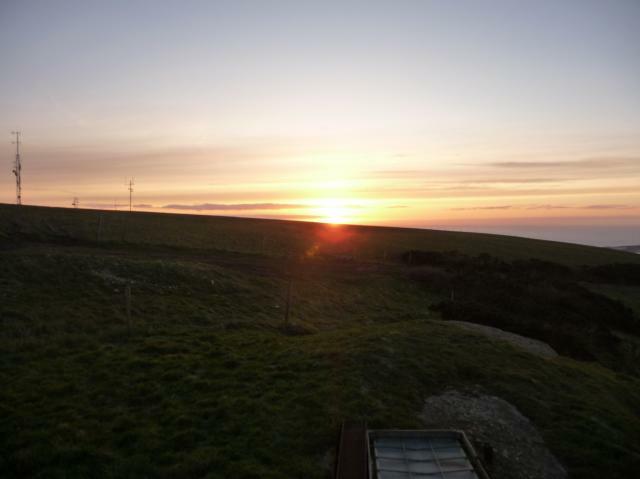 Steep climb cycle, good morning sun rise.Trig in bad state only concrete left topped. perhaps it would be fairer to describe this as "remains" ! 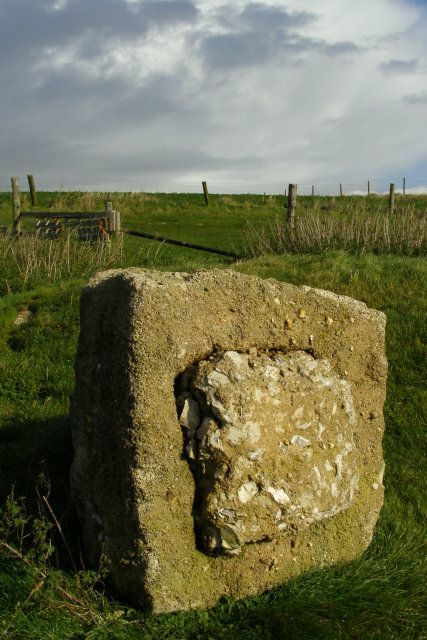 I do remember this pillar in its original position years ago perched on Nine Barrow Down. Today I sat upon its horizontal body to have my lunch, and was instantly cheered by the sight of a puffing white billowing plume of steam (later discovered to be 34070 Battle Of Britain class: 'Manston', for all of you trigging/steam enthusiasts), down in the valley heading towards Swanage from Corfe Castle. It felt like being back in the sixties. 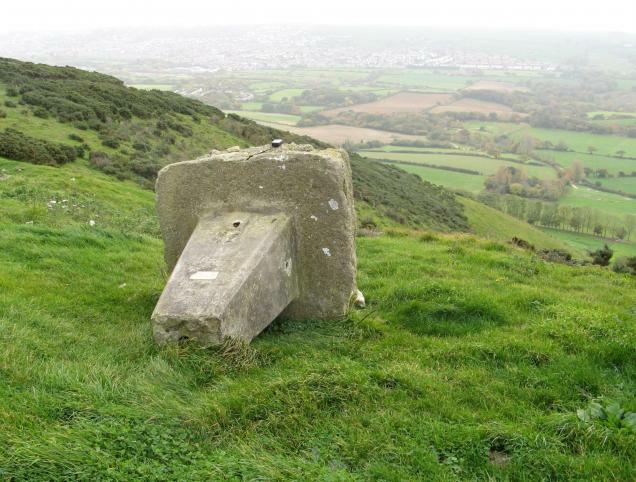 Going up this year: number of times we have visited this trig, average age of group, price of beer in the Greyhound in Corfe. Going down: number in, and fitness of, group. Unchanged: condition of trig! 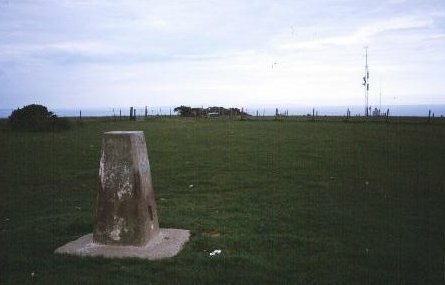 Trig has been moved from the summit of Nine Barrow Down, where I remember seeing it in the 1980s. 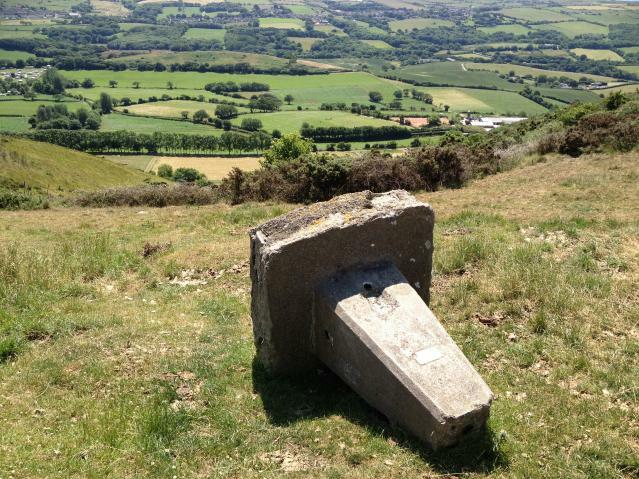 The trig has been damaged and has no FB. On the side of the Marilyn Nine Brrow Downs? 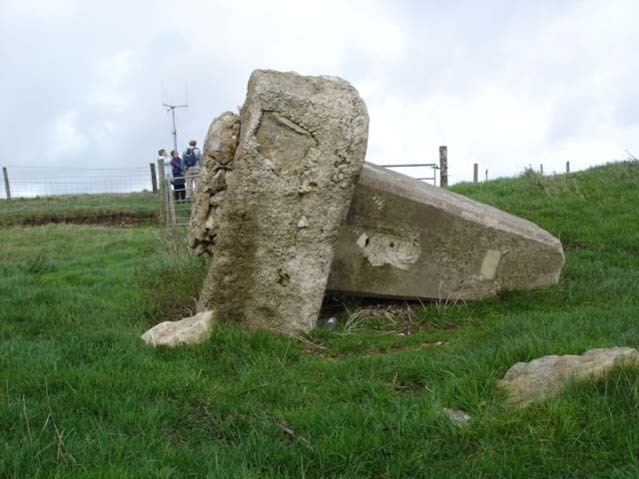 As previous logs have stated, pillar has been moved and is now on it's side with all metalwork removed, easily seen from the footpath. Beware of the big hole underneath the nearby drain cover. Annual visit - much reduced group this year but stunning day for a walk from Studland to Corfe and back - superb views. Condition unchanged from last year. Moved out of field (100m or so south) and turned on it's side. No flush Bracket. visited poorly trig having visited marilyn top. rainy, no views.. if its wet stay well clear of the concrete on resv. top - i didn't & slipped- badly broken arm - many thanks to the folks of dorset who looked after me. Managed to cycle up bridle track from East, then continued along ridge to drop down into Corfe Castle. Enjoyed views out over Brownsea Island, Poole, and Isle of Purbeck. 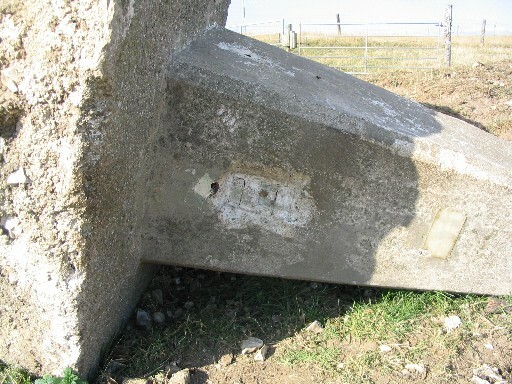 Pillar has been moved from original site and dumped on left of track with metalwork removed. Annual visit - surprised no-one has been in the intervening year. 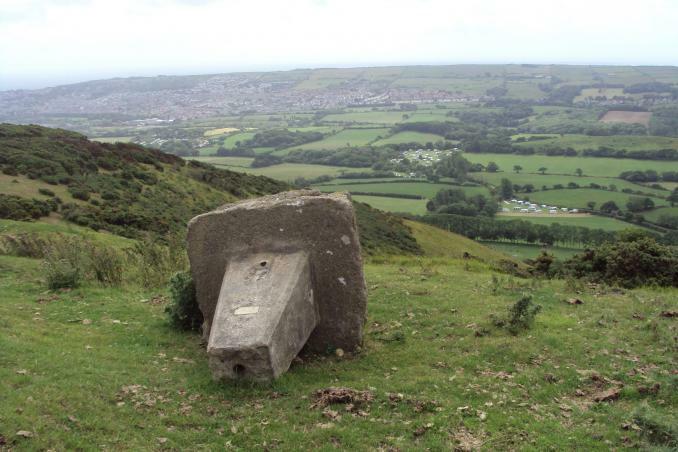 Although the trig is in a sorry (but unchanged) state, the views are still worth the short climb up the hill. Unaware of it being moved (in my early trigging days I did not read TUK logs - my loss) and was looking for it in situ. 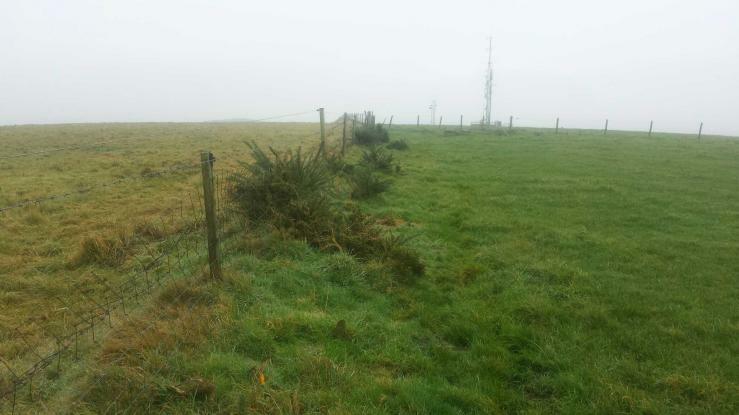 Caught red-handed by VERY angry farmer who has moved the trig "because of people like you!" Annual visit - sorry condition but unchanged from previous years. Overcast, biting cold easterly wind, but superb visibility all the way up the Solent to Hurst Castle Spit (>20 miles). It's complete on it's side, with the the plaque facing the ground so you can't see it. What a sorry sight. 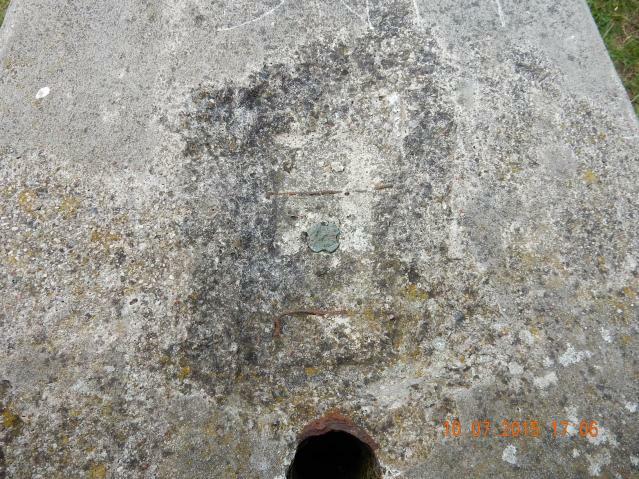 Trig point on its back plug and all with flush plate missing and 100 or so meters away from its original position. Lovely views all round. nothing to add to previous logs, good views from both old and new locations. Annual return visit - at least the views make up for the sorry state of the trig! great location and views, all details as previously said. GR is where the trig now lies. 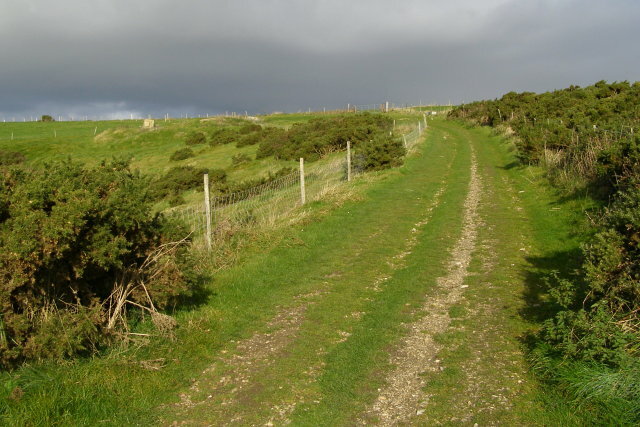 Nearby hill is Nine Barrows Down to Marilynists. Coringdon Now about 100m from its original position. 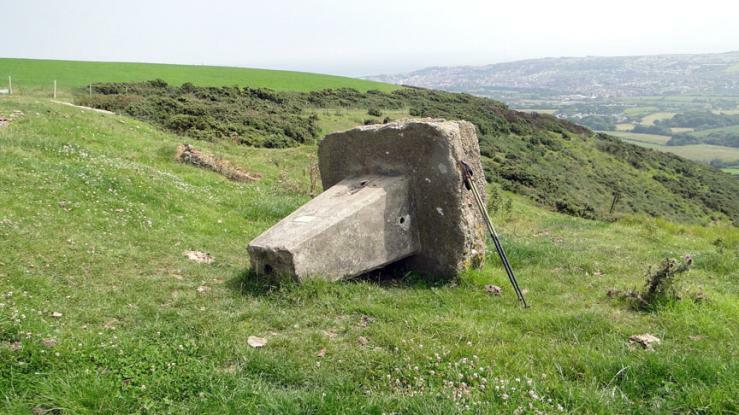 When we visited here we were specifically bagging the Marilyn and as it seems the trig is about 100m from where it should be we didn't see it. Looking at the GPS track of where we walked we would have been about 20m from its original position, so have decided to retrospectively bag this one now we know its fate. Shame, would have been interesting to have seen it toppled. ***Revisited 10 July 2015, 5 years to the day later. Can't see how we missed this, it's now so close to the track. Toppled, FB and spider missing; 3 sight holes open, rear sealed. Good views S over Swanage and southern Purbeck hills. 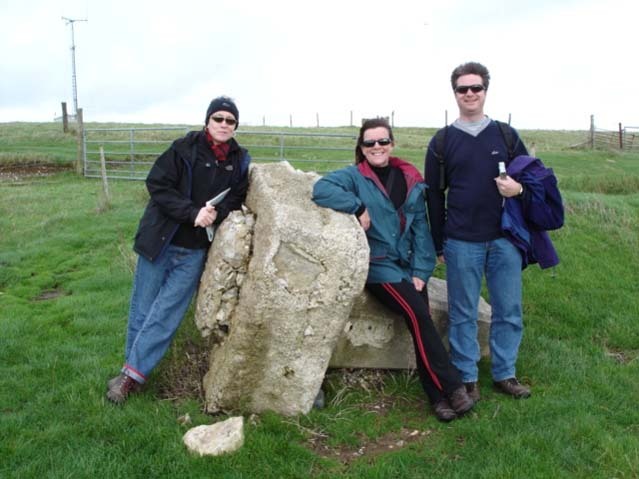 Have been walking exactly the same walk from Studland to Corfe, on Bank Holiday Saturday, with same core group of friends, for over 20 years. 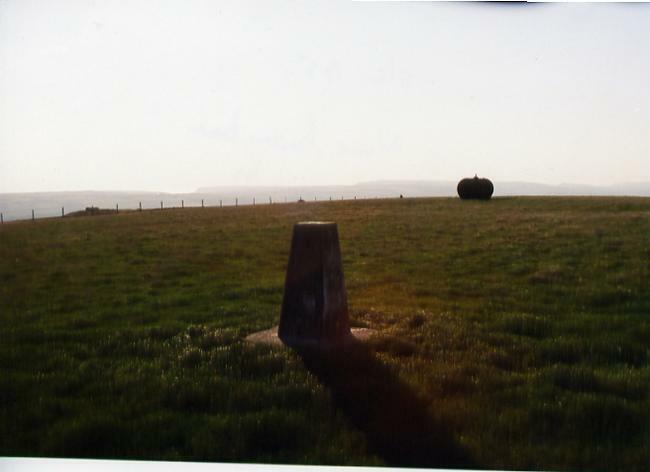 When we started in the late 80s this trig was standing in a field - sadly no more. (Walk the same way back, boring as we are, so technically visited it twice). Spotted out cycling - Simon Coulson sat enjoying the view while Ian, Dave W and I walked up! Annual visit - and good weather as ever. Also on 3 May 2008, 5 May 2007, 29 April 2006, 30 April 2005, 1 May 2004. 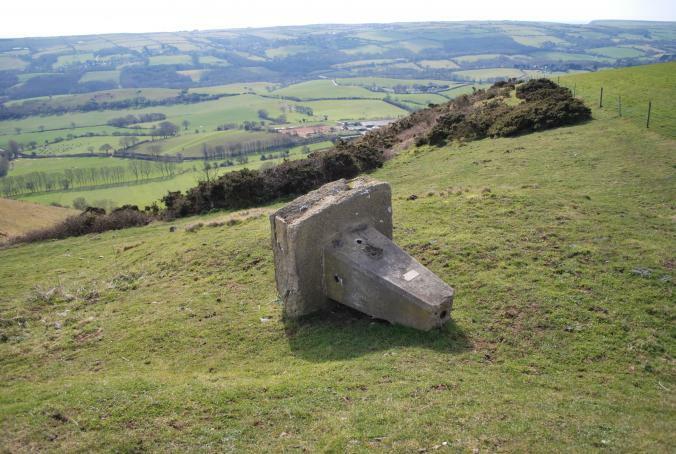 Regarding this toppled trig's new location - is it on top of a filled in bunker? View towards Swyre Head Look upon me all ye mighty and despair etc. Does by bottom look big in this? Ever wondered what the underside of a pillar looks like? Comparing this to some other photos it looks like this pillar has moved around a bit since its big move. Approaching from Ulwell Following the Purbeck Way bridleway up from Ulwell, toppled trig pillar is visible towards the left. Sadly came across this fallen one. What a sad sight. 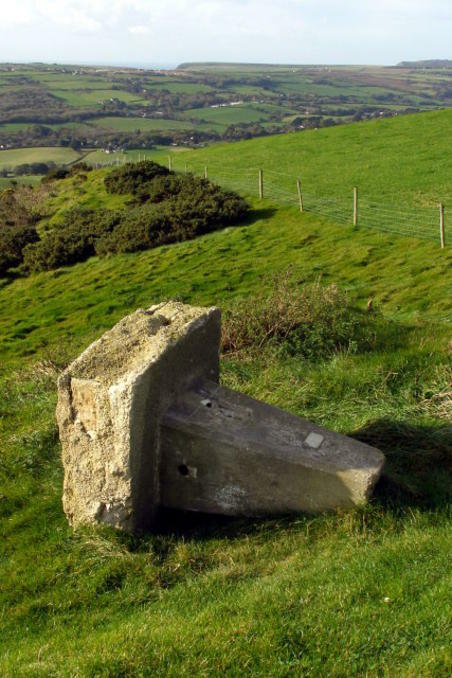 Pillar unceremoniously dumped by the ridge path around 100m south of its proper location. FB and spider have been hacked out. 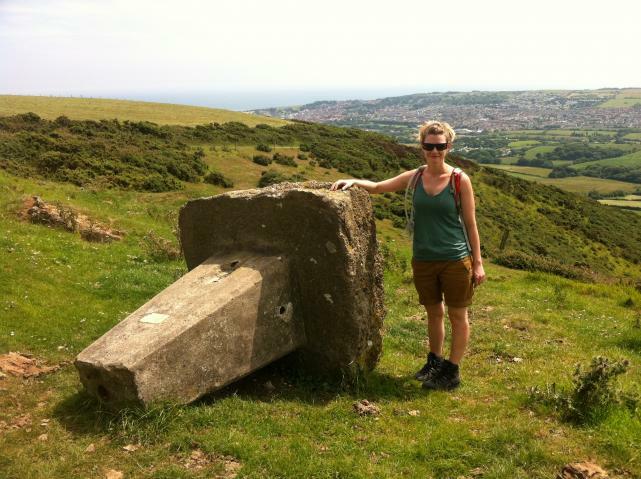 Walked to here from Ballard Down trig point. Not much to add to previous visitor's comments. 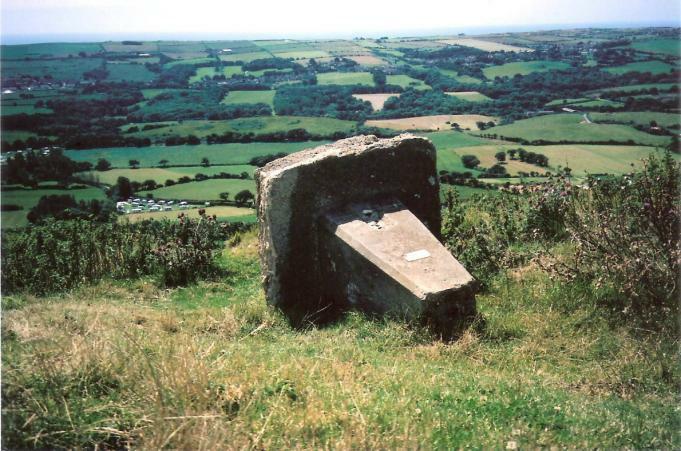 Met a retired surveyor and his wife near the trig, very knowledgable and informative. 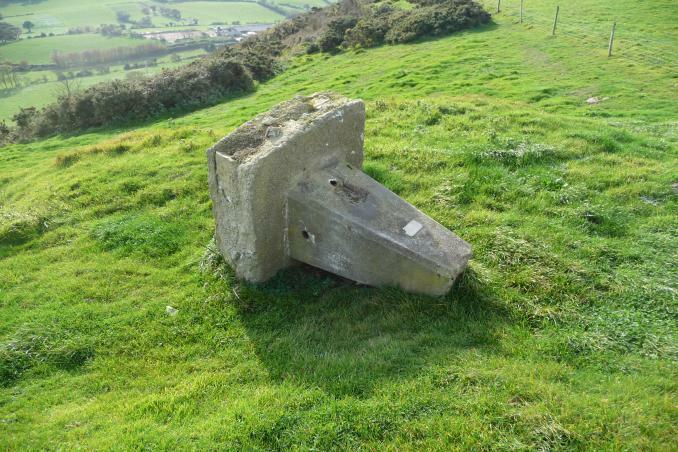 His comment re the trig was " a very sad sight". No obvious reason for removal as original position is pasture close to hedge which has good views especially towards Poole Harbour. 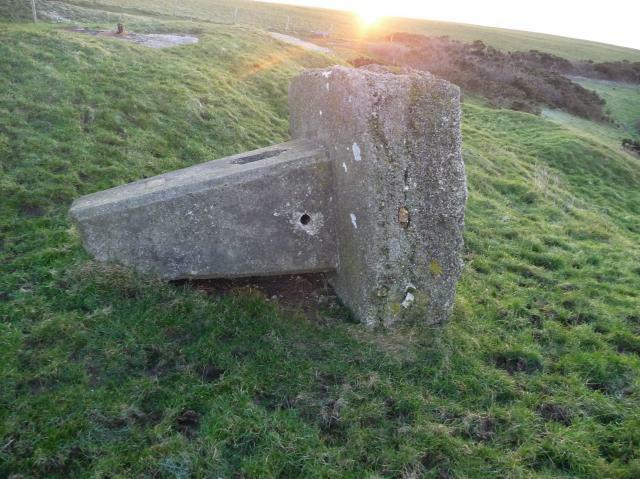 Pillar lies on it's side 100m south close to track. Missing flush bracket, spider & GPS plate top is heavily damaged. Was S1505. Update - revisited 5/1/18, no real change to status in last ten years. Lovely autumnal day on another day off from FMD Guildford. Highest point in private field. Corfe Castle has a spectacular position. Parked near farm just of B3351. 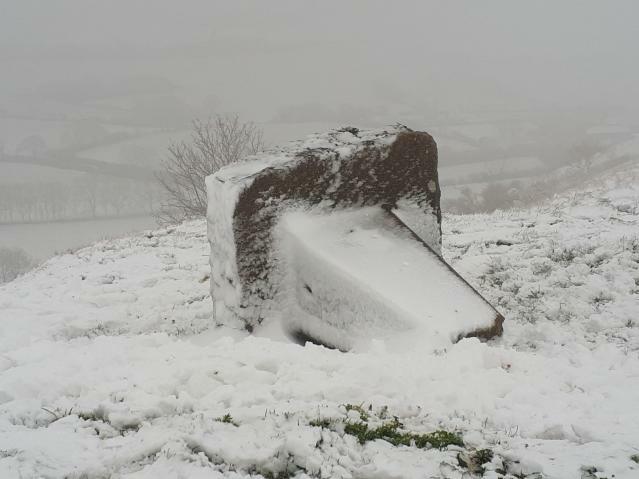 Trig point moved. 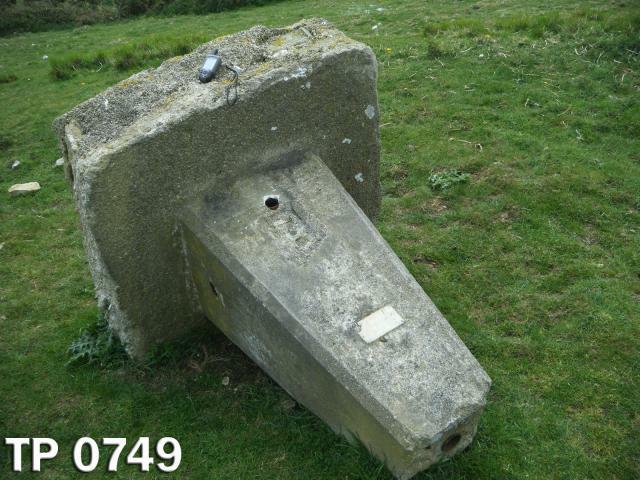 It has been removed to a point some 100meters to the south west. Flush bracket removed! 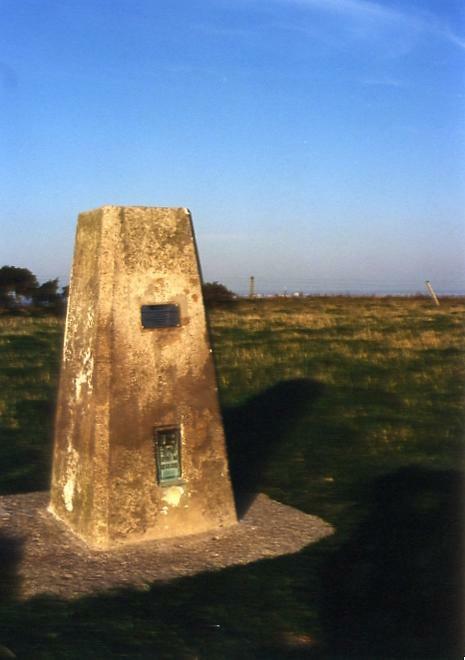 Nine Barrow Down Trig Point Nine Barrow Down Trig Point lying some 300meters to the suth west. 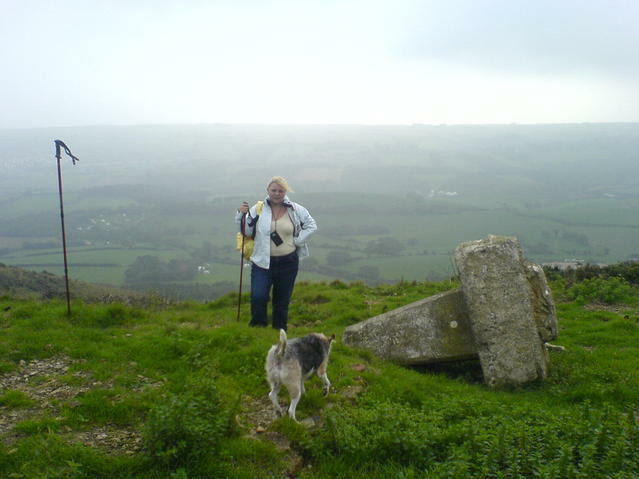 Good walk along the ridge from Corfe Castle. Gate open into ploughed field where the trig used to be. 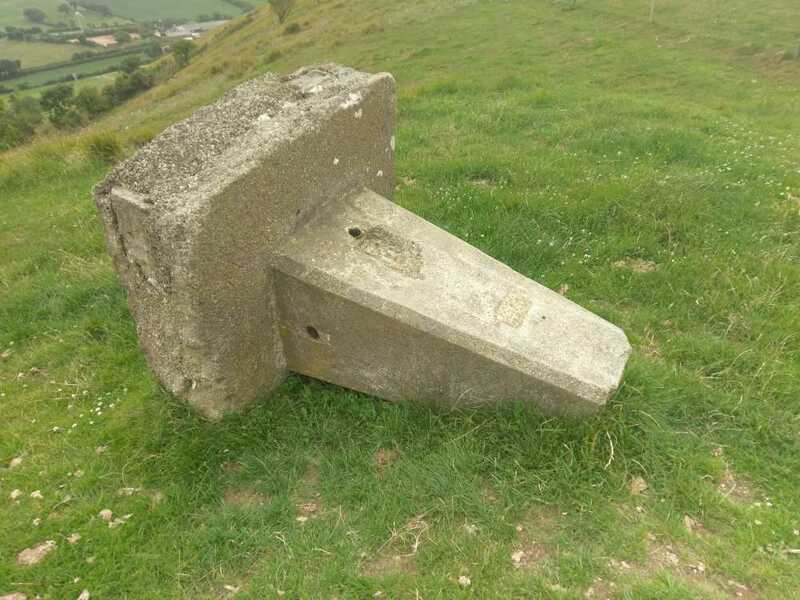 On a 10.5 mile walk from Corfe Castle to Swanage, didn't even know this trig existed, stumbled across this disturbing sight, cried and continued to Ballard Down. 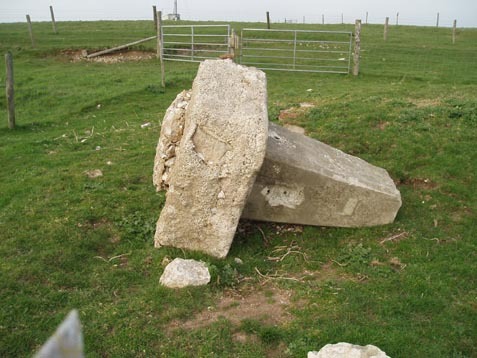 I note an entry in Trigonomy.xls: "Destroyed by farmer fed up with folk climbing his fences. 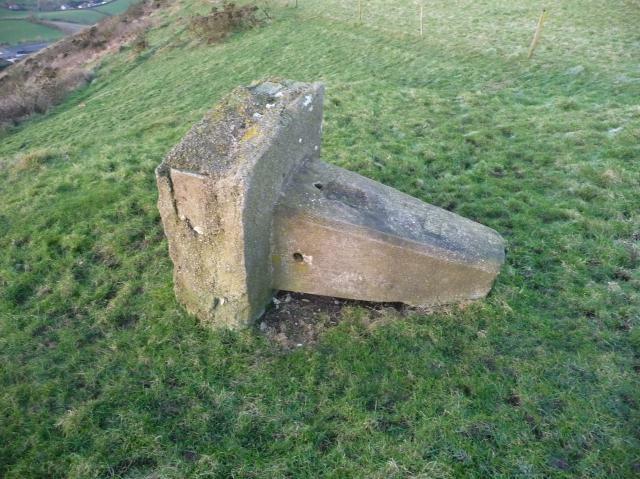 4/03 (OS) Dumped by track 500m south"
As others have noted, this has been moved from its original place. All the metal work has gone, including the GPS plaque. Not the best trig to take two trig virgins from Australia to for their first time! The FB was S1505. Lovely views. I hadn not read the trigointinguk logs before setting out to visit this one so was a bit bemused when I could not find it initially at the top of the hill. Then I spotted it looking very sad and stripped bare as previous visitors note. I wonder if the spider and FB were taken as mementos or fro the value of the brass. 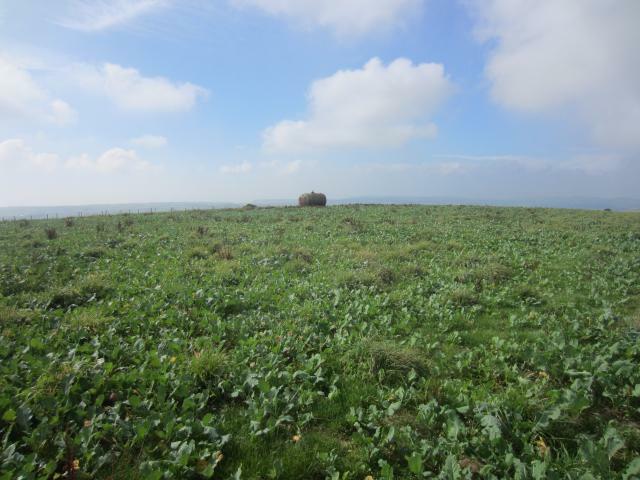 Can not work out why it was moved either as it is pasture land rather than arable. 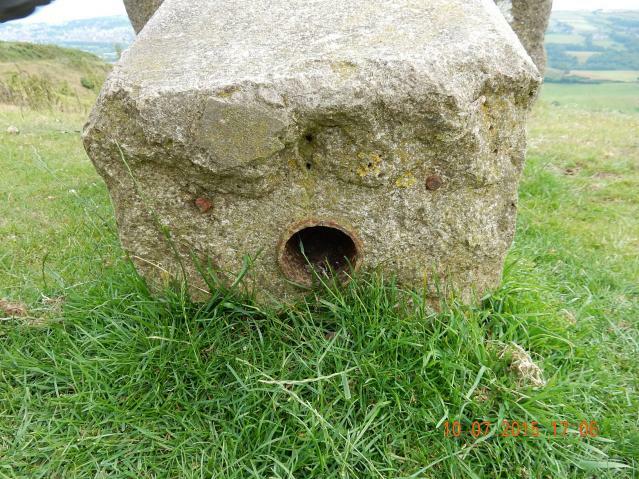 Found this pillar in a field. As logged before it is lying on its side. Also the flush bracket has been removed, it look like it has been chiseled off. The number should have been S1505. Toppled Over & Missing Flush Bracket! Photo showing where the flush bracket should be. 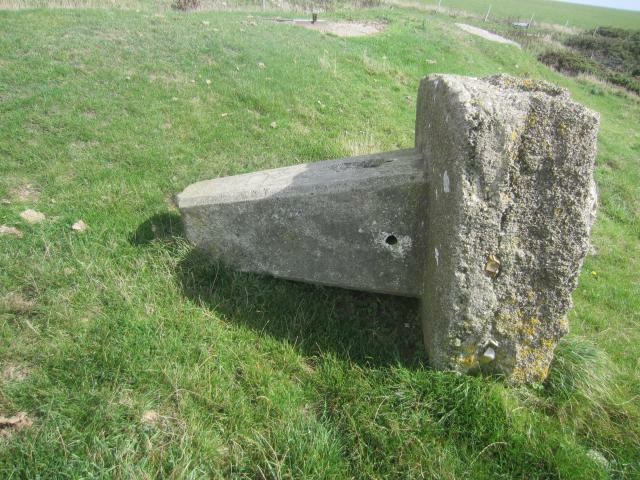 Sadly the first year we encountered this trig on its side some way from its position the previous year. The views are still quite good however. Special mention for 2002 as this was the last time we saw this trig standing in its correct location. In middle of pasture, with great views. 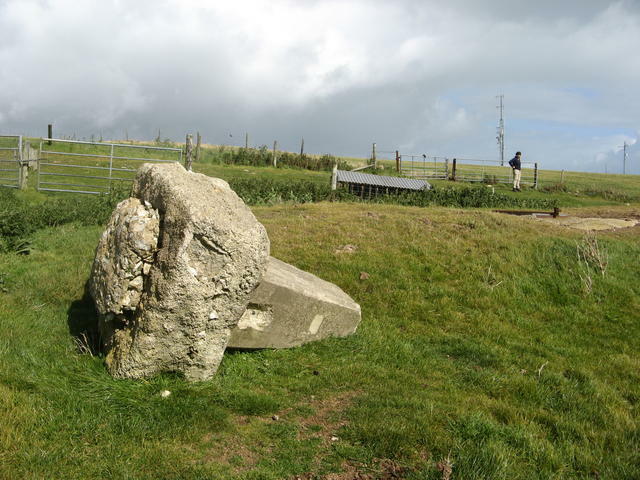 Only actually visited it once because of the trespass involved, remaining years viewed from field edge. I guess the farmer got fed up of other trespassers. A visit in 2001, before the pillar was toppled. Annual visit to Studland, and our walk from there to Corfe and back. This particular year, 1998, the only one we actually visited the pillar in view of the trespass involved. It was in the middle of a pasture field at the time of our visit. Plug with heavily indented lettering. Fifteen mile circular walk starting out from Sandbanks and using ferry. Then via Ballard down and back through forest.